If you are looking for information on the Flamers franchise business opportunity, Flamers Burgers franchises, Flamers Chicken franchising or Flamers Burgers and Chicken franchise, then you have come to the right place. Our story begins in 1987 with a single outlet in Jacksonville, Florida. Like most great success stories, we saw a consumer need and capitalized on it. That need was for high-quality, popular foods prepared fresh and fast in areas of high consumer traffic. Research and a trip out to eat proves that the hamburger is one of the most popular food items in the entire world and has been for the last 75 years. However, most burgers offered in fast-food environments lack that signature charbroiled taste you can only get from an open flame. 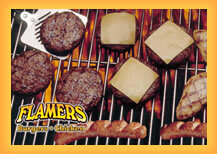 That taste, that quality, is the cornerstone of the Flamers offering and what sets us apart. The next step was simple. We knew that there was a well-established marketing niche in which nothing of this kind was offered - the high-traffic shopping malls, airports, train stations, hospitals and downtown office complexes. So we combined a quality product with this ready-and-waiting market. The result is Flamers Charbroiled Hamburgers and Chicken. Flamers has many distinct advantages when it comes to other restaurant options, so let's pile the reasons on high for you! Easy to learn Operating System-no guesswork! Accepted and welcomed in major malls, universities, hospitals, etc. Common facility maintenance and upgrades-no cleaning the bathrooms! In addition to the above support, Flamers corporate experts are available to assist you in any areas of concern. These excellent information resources are all as close as your telephone. Flamers is dedicated to the same goal that its franchisees are - SUCCESS!